Located along the South Platte River canyon, the town of Bailey offers plenty of local history mixed with ample outdoor recreation. One spot not to miss while visiting the Bailey area is Wellington Lake, offering outdoor fun for the whole family. Take a leisurely drive through the canyon to enjoy the beautiful scenery, or plan on a hike once you get there. The area allows for camping, swimming, catch and release fishing, mountain biking, picnicking and non motorized boating (kayaks, sail boats, canoes, paddle boats). The area figured prominently in the early rush of prospectors to the gold fields of the South Park and beyond. In 1864, William Bailey established a ranch. He found that travelers needed a place to stop for the night before proceeding through the winding Platte Canyon into the high country. Bailey took over a tavern that was built by Henry Crow in 1861 and added lodging accommodations. The area became known as “Bailey’s” - later it was shortened to Bailey. 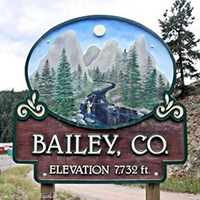 After running a profitable business for many years, Mr. Bailey sold his land and moved to California. Several thousand Railroad bridges were built in America between 1840 and 1880. Among those that survived is Keystone Bridge at McGraw Park. Originally located down river, this bridge served the Denver, South Park, and Pacific Railroad and successor lines until the trains stopped running in 1937. Visitors to McGraw Park can enjoy crossing the old iron bridge and hiking a winding trail through the forest above the North Fork of the South Platte River. The area is a favorite of mountain bikers for its challenging trails. Bailey’s McGraw Historical Park features a number of early buildings from the area including the 1864 Entriken Cabin that belonged to Elizabeth Entriken, William Bailey's sister-in-law, who came west with them and her brother, the famous Father John Dyer. 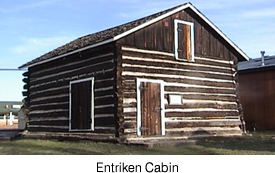 Entriken Cabin, with hand-hewn, squared logs, is listed on the Colorado Register of Historic Properties and it is the only surviving building from the original town of Bailey. In 1878, Ed and Blanche McGraw bought land from William Bailey and built a general store. A successful businesswoman, Blanche continued running the store until her death in 1918. After serving many functions over the years, including a theater and hotel, it has operated as the Bailey Country Store for many years, but now is known as the Sasquatch Outpost. In continuous use since being built in 1901, Glen Isle Resort is listed on the National Register of Historic Places. The resort was built on an old Indian camping ground. Even in the past years, Indian artifacts have been found on the property. 8/10/2019 – PCACC Car Show, 10am - 2pm. Limited to 75 cars. Call Ann at 303-838-1401 for more details. Lynwood Park - Hostel accommodations & camping for Colorado Trail. Showers & laundry available. Hikers Store & Oxygen. Guanella Pass Scenic & Historic Byway - Follows an old wagon trail used by miners traveling between Georgetown and Grant. Gold lured miners and others to the area, but it was silver that brought prosperity to the valley. Today, visitors may explore this 22-mile historic route by car, and/or hike the many area trails. Lynwood Park - Located on the west end of Bailey, Lynwood Park has a small pond that contains abundant trout (no license required). The adjacent North Fork of the South Platte supports rainbow, brook, and brown trout for other anglers (Colorado fishing license is required). Lynwood Park offers some lodging options near the river. Fish by the Inch. McGraw Park - Owned by the Park County Historical Society, this 20-acre historic park allows public access on both sides of the North Fork of the South Platte in Bailey. This short section of the North Fork provides seasonally good fishing for wild browns and rainbows up to 18 inches. McGraw Park is also a launching point for whitewater kayaking in the North Fork. Other amenities include public restrooms, a riverside picnic area and a hiking trail. For current fishing information, contact the Knotty Pine Sports Center in Bailey at 303-838-5679. Upper Deer Creek - Backcountry stream fishing for small brookies and browns in the Pike National Forest. Take County Road 43 northwest of Bailey to the trailhead about one mile beyond Deer Creek Campground. Some pools hold larger fish in this small creek. Lower Lake Ranch - Lower Lake Ranch provides catch-and-release fly fishing on three different lakes for their overnight guests. Turn right at the Staunton State Park exit, 4 miles west of Conifer. Craig Creek - Scenic beaver pond fishing for small brookies in the Lost Creek Wilderness area. Stream access requires a five-mile hike up the Colorado Trail (#1779) from Park County Road 543 southeast of Bailey. While the fish aren't large, they are abundant and anglers usually have the stream to themselves in this remote setting. Wellington Lake - Located southeast of Bailey, Wellington Lake is a 167-acre trophy fishery stocked with rainbow, brown, brook, and cutbow trout (no license required). Fishing is catch-and-release only. Year-round fishing, including Ice Fishing is offered. Suggested Use Key - Suggested uses are based on user feedback and US forest Service Travel restrictions. Road and Trail restrictions are subject to change over time. Notice: Many of the roads and trails described above are closed on a seasonal basis to protect wildlife. Please respect all closures and stay on designated routes to prevent resource damage.